It happened again. Beast mode. 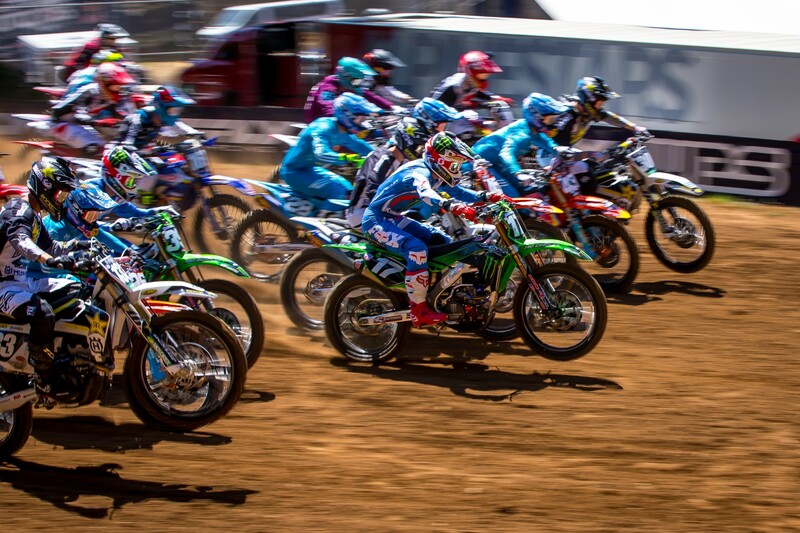 What Eli Tomac has unleashed this summer in Lucas Oil Pro Motocross is starting to reach legendary status, as he launched another incredible second-moto comeback to dig out another 1-1 sweep of the motos, this time at the Motosport.com Washougal National in Washington. Last weekend’s scintillating performance at Spring Creek, where the Monster Energy Kawasaki rider put in a lap four seconds faster than anyone else to win the second moto, seemed all-time, but he actually topped it at Washougal due to a quick tip-over while running third. He was briefly shuffled back to fourth place, and hope appeared to be lost. But with beast mode engaged, Tomac chopped nearly four seconds a lap off of everyone else again, and with two laps to go he made the pass on Ken Roczen to take the lead and 1-1 scores. The Washougal fans signaled their approval with huge roars for Tomac as the comeback begin to build. Yeah, this stuff is becoming something of legend. Tomac has won all but two overalls through nine races this year, yet still holds only a slim 15-point lead in the standings due to one bad weekend at RedBud. That makes these battles even more dramatic. In the first moto, Tomac started in front of his title rival Marvin Musquin, and made quick work of the Autotrader.com/Yoshimura Suzuki duo of Justin Bogle and Justin Hill to get the lead. Musquin moved to second and Roczen to third, but they couldn’t quite match Tomac’s pace. The second moto though, was better for both Roczen and Musquin, as they looked aggressive while immediately racing to the front. Eli started around tenth. For awhile, it seemed like Roczen would win the day with 3-1 scores, and the crowd also roared with approval for the potential of that popular outcome. Until Tomac put in his charge--then the fans got swept up in it, just like Tomac's competition. Red Bull KTM’s Musquin had a consistent day with 2-3 scores, but couldn’t quite stay with Tomac in moto one, and couldn’t quite get Roczen in moto two. With Tomac, Musquin and Roczen all making a late-season surge, Justin Barcia found himself off the podium for the second-straight race after a flurry of rostrum visits earlier in the season. Barcia is riding well on his Monster Energy Yamaha, but is just a tick off of what the lead trio has thrown down over the last four motos. He was fourth at Washougal. Justin Hill, a local product, was in this mix for that fourth-place spot for most of the day. He was second-fastest in qualifying, then fourth in moto one, then ran third for a bit in moto two before a huge crash on a downhill sent his Suzuki flying into a tree! Hill’s moto was over, but luckily the bike, and tree, took on more damage than him. According to Justin’s brother Josh, who was at the race, Justin’s knee was swollen and bruised up, but x-rays were negative and there appeared to be no structural damage also. His Autotrader.com/Yoshimura Suzuki Team Manager Jeremy Albrecht sounded optimistic that Hill had not suffered serious injuries, and Justin was eventually able to get back on his bike and ride it back to the pits after the bike was finally pulled away from the tree. Fifth overall ended up going to Blake Baggett, who went 6-5 on his Rocky Mountain ATV/MC WPS KTM. In his post-race interview on NBCSN, Baggett lamented that he's not quite up to pace with Tomac, Roczen and Musquin, and mentioned possibly trying to hook up with one of them during the upcoming break to log some practice motos at race pace. 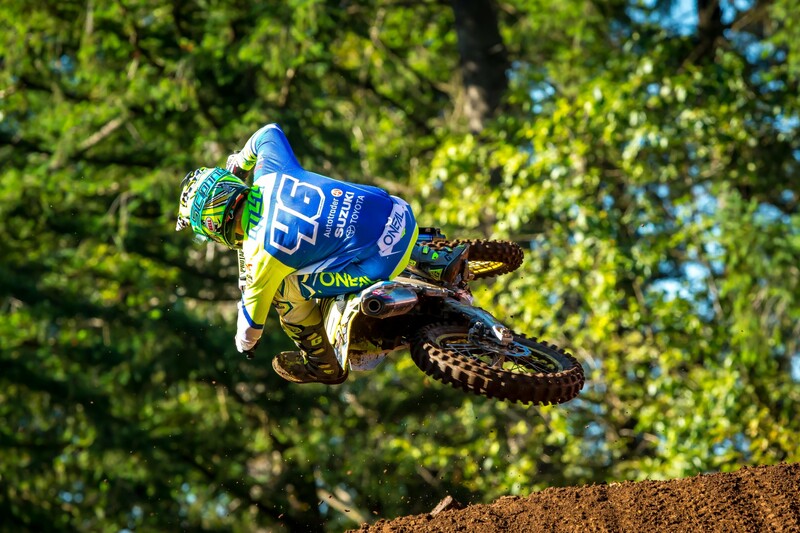 In the 250s, Aaron Plessinger’s season continues to have the look of a champion. Simply put, when you’re hot, you’re hot. The Monster Energy/Star Racing Yamalube Yamaha rider wasn’t the fastest man at Washougal like he was at RedBud and Millville, but his 4-3 scores ended up being enough for another overall win. Joey Savatgy won moto won but crashed in the second turn of moto two, and Shane McElrath won moto two but struggled to ninth in moto one. 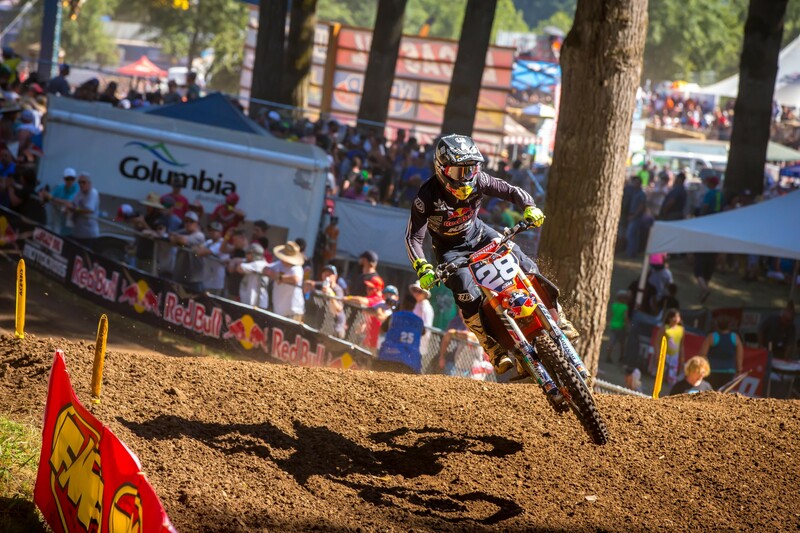 McElrath’s second moto win was a career first. “First moto I followed too much, made a big bike change for second moto,” said McElrath, of Troy Lee Designs/Red Bull KTM. “I knew we could get a good start and go where I wanted. Really the first time I’ve felt like that all year. The team is working hard and being patient, we’re getting better every week.” His 9-1 gave him second overall. 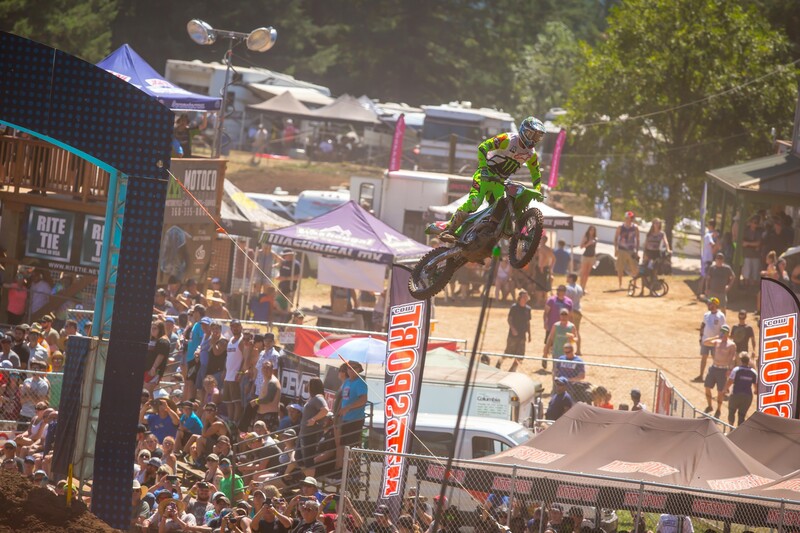 Last year, Savatgy won Washougal with wild 7-1 moto scores. Had he gone 1-7 today, he would have won it again. After edging his teammate Austin Forkner for the moto one win, he was 25th on the opening lap of moto two. He clawed his way to ninth, but it wasn’t quite enough. Still, it was Savatgy’s first overall podium of the season, and the first moto was even sweeter for his star-crossed Monster Energy/Pro Circuit Kawasaki team, since Forkner finished second. The start did Savatgy in for moto two. The second moto was worse for Forkner. He was third early and in position for the overall win—or at least a podium—when a scrub went wrong on a big jump. Forkner crashed hard and his moto was over. This is the fourth-straight race where Forkner was in position to battle for the win only to see a crash undo even a podium result. A check with his team at the end of the day revealed he was sore but not seriously injured in the crash. As for Plessinger, he ran fourth for all of moto one, not quite able to get Jordon Smith or the Kawasaki duo up ahead. He was second and chasing McElrath for most of moto two, but a brief crash let his teammate Dylan Ferrandis get by. Third was enough for the overall win, though, his fifth of the season. Smith followed his first-moto podium with 13th in moto two, and Ferrandis had a fall and a stall in moto one, leaving him in 11th. Ferrandis' 11-2 scores gave him fourth overall. 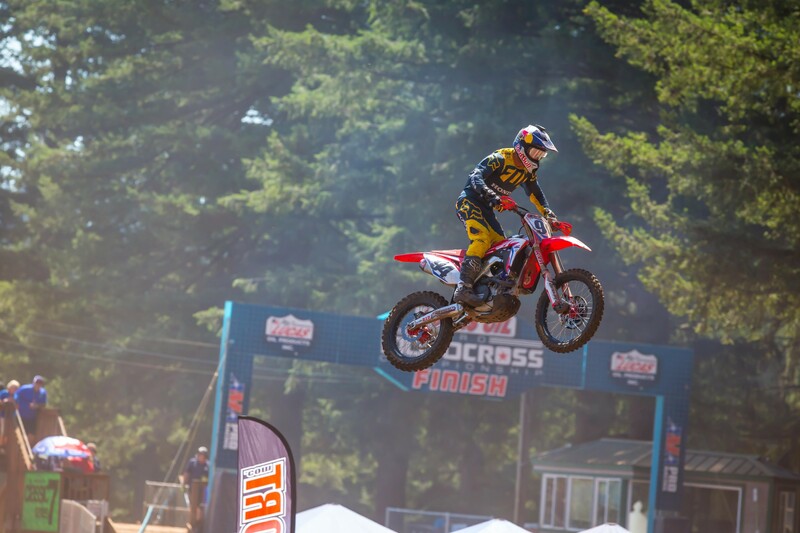 The 125 All-Star race at Washougal featured a true All-Star lineup. 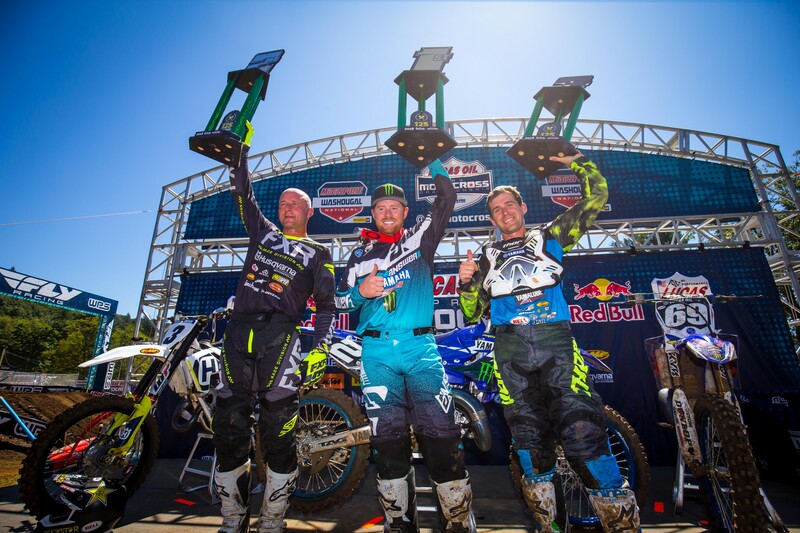 Ryan Villopoto (center) scored a popular win in front of his home-state fans. The ageless Mike Brown (3) almost ran him down but ended up second, and Wil Hahn (69) was third.